You’ve probably seen quesadillas on many restaurant menus. If you’ve ordered them as your meal, you may have left still a bit hungry. 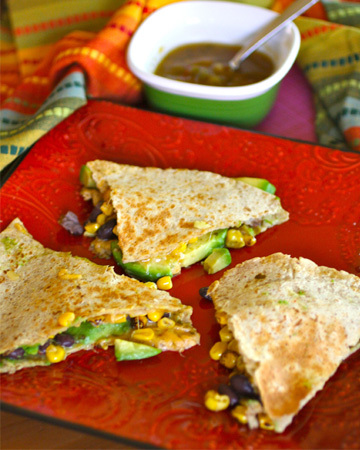 Not your average quesadillas, this Sunday dinner recipe for roasted corn, black bean and avocado quesadillas is hearty, healthy and only takes a few minutes to make. You can work up quite an appetite on the weekend! Whether you’ve been swimming, at an amusement park, visiting family or running errands, your family might be ravenous by the time Sunday dinner rolls around. When you’ve got a hungry family to feed, try this simple recipe. 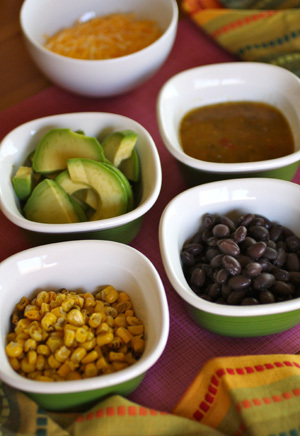 It’s stuffed with a bunch of filling favorites like roasted corn, black beans and avocados. If you want to swap one of the ingredients with something different, by all means, swap! Use the salsa and cheese of your choice. Whatever you use, these quesadillas are sure to satisfy (and they’re so easy and quick to make). Gather up all your ingredients and place near the stove top. Spray a large skillet with nonstick cooking spray and place the skillet over medium- to medium-high heat. Add one tortilla to the skillet and layer it thinly with the cheese, black beans, salsa, corn, avocados and a bit more cheese. Allow the tortilla to cook for two or three minutes, until the cheese begins to melt. Add a second tortilla to the top of the mixture and carefully flip it over (the quesadilla will be full so you’ll need to take extra care). Cook for another two or three minutes. Repeat with the remaining tortillas. Serve warm with extra salsa for dipping, and sour cream as garnish if you’d like. A few flips in the skillet and you’ll have a great meal for your family.